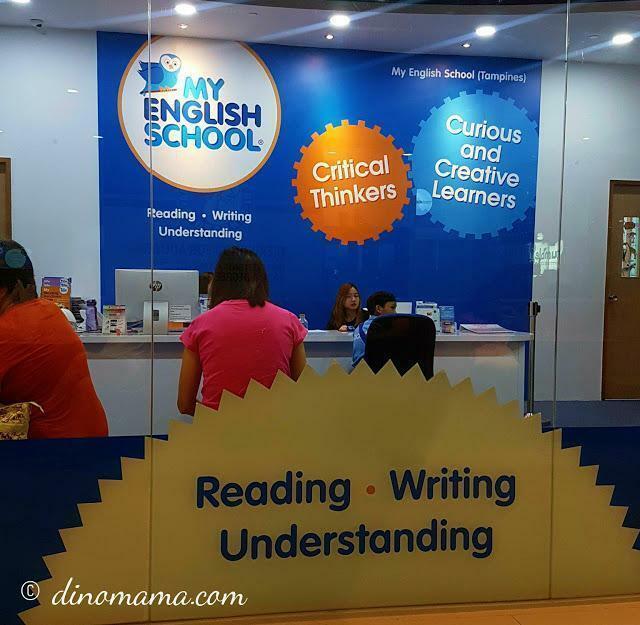 These days, our Sundays have gotten busier with DinoBoy attending support lessons at an English school. Thus far we have been coaching him on our own. However, we realized that there are some components in English for which we need to seek professional help. Earlier this year we were given an opportunity to connect with My English School, and after attending a full term we decided to continue with them. This was mainly to help DinoBoy prepare for the last leg of Primary school – the PSLE or Primary School Leaving Examination. Why did we make this decision now? As far as language is concerned, the schooling system in Singapore has a bilingual education policy. This means that kids are taught both English and mother tongue: Mandarin, Malay or Tamil. English is also officially the main language of instruction in all subjects (except for mother tongue, of course). So, if a child doesn’t understand the fundamentals of English, they would probably struggle with other subjects as well. Have you seen the primary school science and mathematics open-ended questions? Some are so complex that they could even confuse us adults. Kids who are weak in English have to struggle with understanding the language first before they can even attempt to solve these questions! It is undoubtedly an exasperating experience for them. I feel that to master a language we must be able to articulate our thoughts using the right vocabulary to form logical and grammatically correct sentences. This is where DinoBoy struggles. Although he is articulate, he is not great at penning down his thoughts. That is why I decided that it was time to get some help. My English School teaches children aged 2.5 to 12-years-old mainly at two levels – pre-primary and primary. Children are taught a variety of subjects including phonics, reading and primary school English. They have their own in-house materials written by experienced curriculum writers who are former Ministry of Education (MOE) teachers. Therefore, we can be certain that their materials and classes are aligned to the current MOE syllabus. Younger children are taught through a systematic, structured reading programme to cultivate their phonemic awareness – i.e., the relationships between letters and sounds in the language. Phonics is more than just knowing to pronounce a word. Knowing how to pronounce a word does not necessarily mean that the child understands the meaning of it, or its application. My English School recognizes this and have designed four levels of phonics classes to help students as they progress. After kids have gained confidence reading independently, they are promoted and prepped for English in Primary school. My English School Primary programme provides ample support to children to ensure they have a good foundation before they enter Primary One. 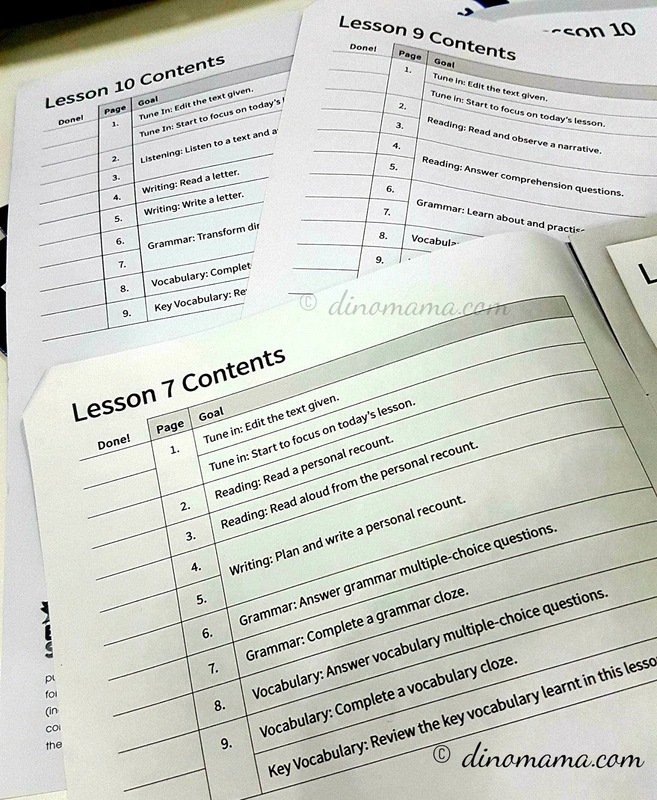 You might agree that there are a few components in the English syllabus that kids struggle with – namely comprehension, comprehension cloze, composition and oral. 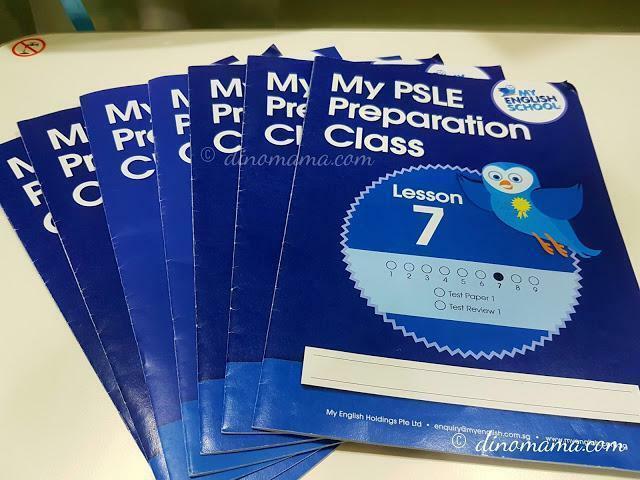 The PSLE preparation classes aim to hone the techniques in these components so that they have greater confidence in tackling them during the examination. 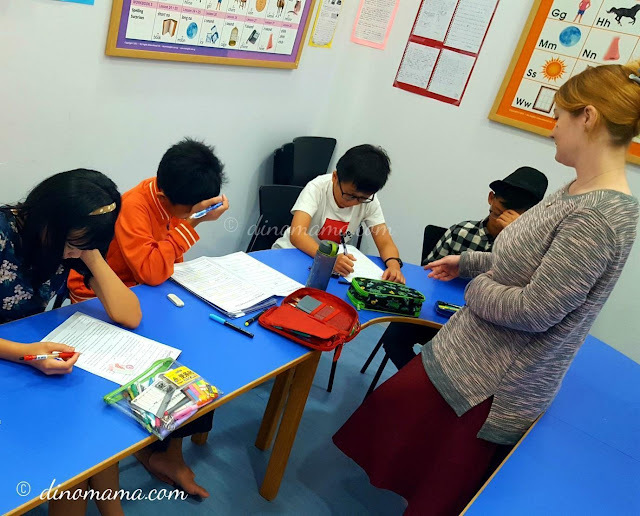 My English School classes are conducted in a classroom that can comfortably accommodate nine to 10 students and the teacher. I like this small student-teacher ratio because the teacher gets to know the kids better and is able to effectively help them in their weak areas. According to DinoBoy, his teacher first checks the previous week’s homework. She then helps the kids if they have any queries pertaining to the homework. The day’s lesson follows. DinoBoy further shared that classes are not boring nor rigid. Instead, they are “fun” and engaging, and sometimes games were played to help them learn new words or phrases. Each week the teacher focuses on a different area, and I like that every component is given equal attention. Kids also have ample opportunities to practice and master their “answering techniques”. 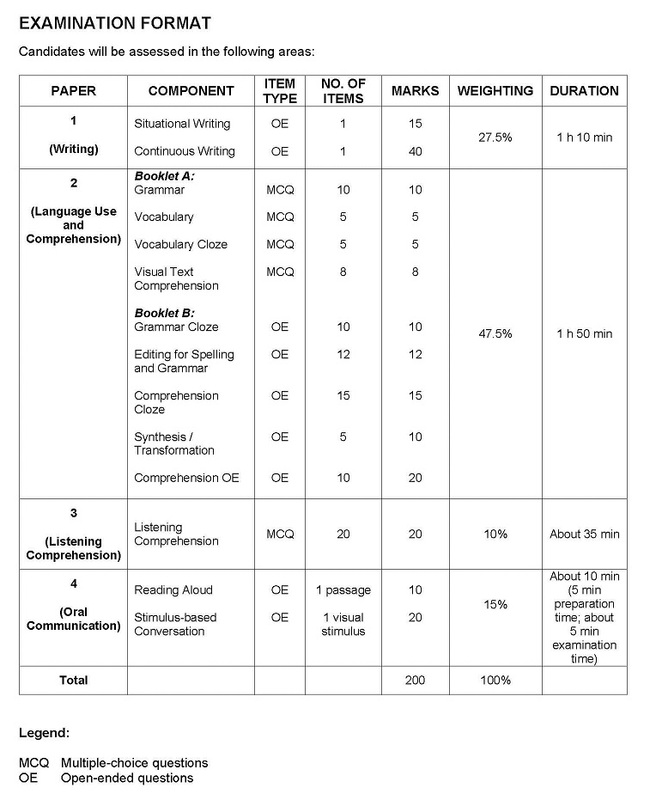 Below is the examination format taken from SEAB or Singapore Examinations and Assessment Board, indicating the marks allocated for each component of the English paper. In DinoBoy's case, his challenges are composition, comprehension, comprehension cloze and oral: these carry the most marks. I strongly believe that if he is able to improve his score in these components, his overall English marks will improve significantly. 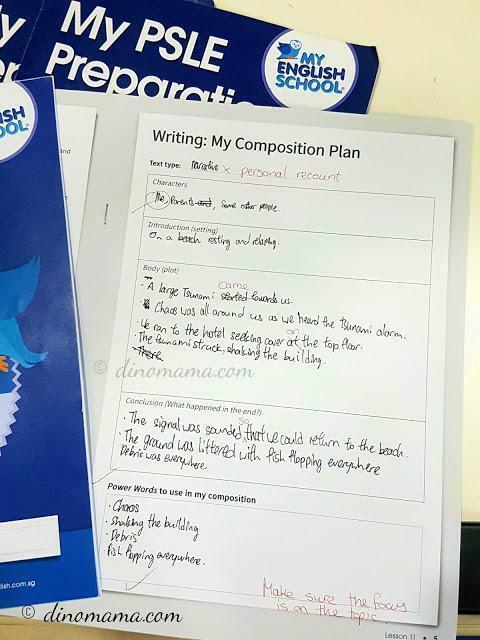 Having difficulties transforming his ideas into written words becomes a problem for composition and comprehension for DinoBoy because these two components require him to write fluently. Without the ability to write confidently he is not able to produce a creatively crafted composition, nor answer the comprehension questions in logical sentences. Language learning comes easy for me but I face difficulty when it comes to teaching. I tried to guide DinoBoy to expand his thoughts on composition story lines such as using the 4W1H method but failed miserably. At school, DinoBoy learnt to use the 4W1H method together with plot graphs and suspense indicator graphs to create an outline for his composition. However, I felt it didn’t work well as he scribbled (see below picture) words/phrases on the graph with ideas and story lines etc. I also realized that he sometimes misses certain points written down on the graph which makes him veer off the topic. This causes him to not be able to resolve the problem or conclude the story. My English School's simple helping sheet - my composition plan - lists out the necessary components required for the writing. This enables him to visualize his story better. There is also a section for him to write "power words" that he thinks should be used in his composition. These power words or phrases will definitely fetch him some extra marks! Another plus point is that the teacher requests the students to read comprehension passages aloud. This not only gets the kids’ attention, but also allows them to practice for oral as she asks them to pay attention to their pronunciation, speed, pitch/tone when reading. DinoBoy shared that his teacher encourages them to find the answer, but doesn’t point it out to them. At school, DinoBoy has English read-aloud programmes per term, for which he scored level 4 out of 5 for both read-aloud and stimulus-based conversation. 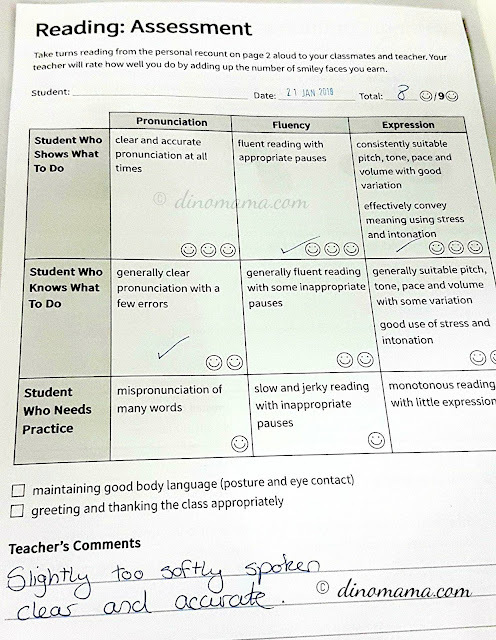 His form teacher commented that this is because his reading is not smooth, and that he hesitates. 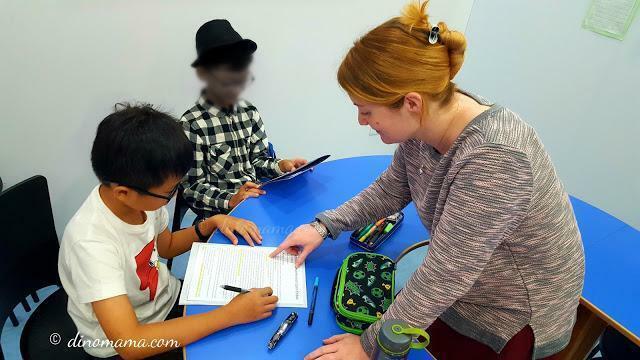 During oral examinations, the examiner not only expects the student to speak confidently, but they also focus on good pronunciation, clear articulation, expressiveness and rhythm while reading and conversing. I have tried to help him but it hasn’t proven to be successful as our ideas never match. I feel he needs someone to guide and coach him in this area but the school is unable to do so due to their tight teaching schedule. Last year I shared briefly that DinoBoy has a mild stammering issue, which added to the problem. This not only affects his oral fluency – especially when he is in an exam-induced stressful situation – but it also has a major impact on his overall score. Upon starting classes at My English School, I informed the teacher about DinoBoy's slight stammer. I love that she took note of the problem and worked to help my boy. To this day she keeps me updated about this, and recently mentioned that the stammering has reduced quite a bit. Her advice to him was to calm down, gather his thoughts and talk slower during a conversation or when answering questions. 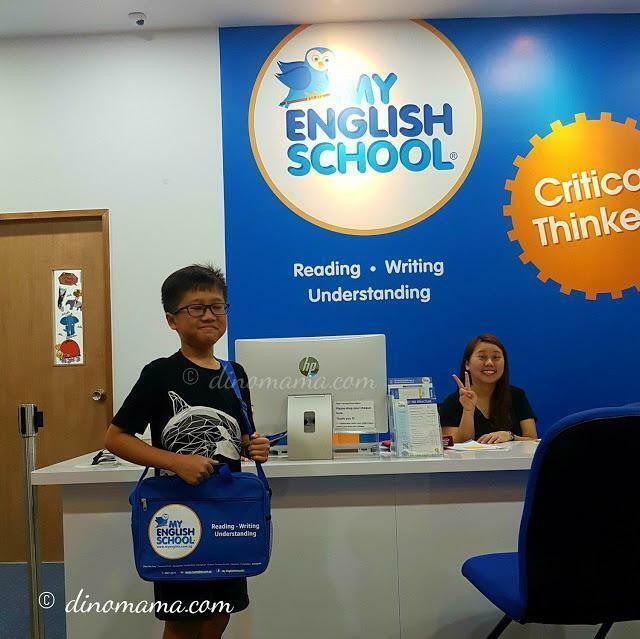 Now that he has the guidance of a professional, I am confident that he will be better prepared in his oral exams when he sits for PSLE later this year. I received My English School’s term report before the end of the term. The students were graded on six main criteria. We also had a parent-teacher meeting and I am heartened by the teacher’s feedback. She said that based on the two class tests done this term, DinoBoy is a strong middle B student. She added that if we continue working hard together he can easily push his mark to an A! Final thoughts – kudos to teachers! I believe that a child learns faster and better if they are able to connect with their teachers. Besides ensuring that the teachers are qualified, how they interact with students are of upmost importance too. I remember asking DinoBoy about his first class at MES. All he said was, "ok lor, same as school." However, when I asked him about his teacher, his face lit up immediately. He excitedly told me that his teacher was friendly and approachable and that he loved to listen to her interesting stories. She seems to be a big part of why DinoBoy is doing well at My English School. But what was most touching was when he said that she encouraged him when he was unable to articulate his ideas and praised him for trying. Despite having to wake up early on weekends to get ready for class, DinoBoy never protests; instead he looks forward to his class! Even though there was no significant improvement in DinoBoy's results at his mid-term continuous assessment, I decided to let him continue with My English School mainly because I see tremendous potential for improvement if we continue on with the school. - When he does his school work, he no longer struggles with story line construction as he uses My English School's method of composition planning. - He takes time to read through the comprehension cloze passage twice in order to understand the passage. Back then with about five months to PSLE preliminary examination, we really do not have much time left. But I am confident that with the support from his teacher at My English School, DinoBoy's English results will definitely improve. If you are interested to know more about My English School, check out their centre locations and give them a call. Alternatively, if you would like to let your child start their learning journey with them, simply just book an assessment with them. Disclaimer: We were given a complimentary one term lesson at My English School for the purpose of this advertorial post. All photographs in this post belong to My DinoFamily, you may not use them without our permission. All opinions in this post are 100% based on our experience with My English School. PS: For privacy purpose DinoBoy's My English School classmates were told to look down or hide their face when photos were taken so it is not that they are sloppy or uninterested in their lessons. On the contrary, they have excellent learning attitude!